Send your events and actions to us at samidoun@samidoun.net, on Facebook, or use the form to tell us about your actions. We will be regularly updating this international list of events and actions for Palestinian Prisoners’ Day. Organizers in Palestine and around the world are gearing up for the international week of action for Palestinian prisoners from 14 to 24 April, marking Palestinian Prisoners Day on 17 April. Every year, on 17 April, Palestinian prisoners, the Palestinian people, and supporters of justice and liberation for Palestine all over the world mark the International Day of Solidarity with Palestinian Prisoners. This date is one of protests, rallies, marches, forums and actions to commemorate, support and build solidarity for the struggle of imprisoned Palestinians. In 2017, we join with the Palestinian prisoners’ movement in urging all organizations and people of conscience to organize actions for Palestinian freedom between 14 and 25 April 2017 in commemoration of Palestinian Prisoners’ Day. Read the Samidoun call to action for 2017 and download posters and flyers for your events. Please add your own local actions to this list! Email us at samidoun@samidoun.net, on Facebook, or use the form to tell us about your actions. Building this strong list of actions around the world will help to underline the global support for Palestinian political prisoners in their struggle for freedom, and the struggle of the Palestinian people for liberation. Parma, Italy – 8:30 pm, Il Pedale Veloce, Borgo Bernabei 29, 43100 Parma: Occupation, Repression and Resistance in Palestine. For more information: https://www.facebook.com/events/273546809759141/ Organized by Gruppo Azione Palestina. Berlin, Germany – 7 pm, von Wittenbergplatz bis Joachimstaler Str, Berlin: Solidarity with Hunger-Striking Palestinian Prisoners. For more information: http://palaestina-solidaritaet.de/2017/04/26/berlin-sa-29-04-2017-menschenkette-in-solidaritaet-mit-den-palaestinensischen-und-arabischen-gefangenen/ Organized by the Palestinian National Action Committee in Berlin. Aarhus, Denmark – 4 pm, Radhuspladsen 1, Aarhus: Protest for Palestinian Prisoners on Hunger Strike. Organized by the Committee of Associations to Support the Prisoners. Gothenburg, Sweden – 1 pm to 3 pm, Fredsbron, SE-411 O7 Gothenburg: Demonstration for the Palestinian prisoners. For more information: https://www.facebook.com/events/290914928021175/ Organized by Palestine House in Gothenburg. London, UK – 2 pm to 4 pm, Israeli Embassy, 2 Palace Green, London: Protest for hunger-striking Palestinian prisoners. For more information: https://www.facebook.com/events/1703123046370362/ Organized by a number of organizations. Torino, Italy – 4 pm, Presidium in Piazza Castello, Torino: Solidarity with Palestinian Prisoners. Organized by Invicta Palestina and a number of groups. Berlin, Germany – 2 pm to 6 pm, Info Stand, 6 pm to 8 pm, Demonstration, Potsdamer Platz, Berlin: Solidarity Demonstration with the Palestinian Prisoners in Israeli Jails. Koblenz, Germany – 4 pm to 6 pm, An der Herz-Jesu Kirche, Lohrstrasse 1a, Koblenz: Demonstration for Palestinian Prisoners. For more information: http://palaestina-solidaritaet.de/2017/04/26/koblenz-sa-29-04-2017-kundgebung-fuer-die-palaestinensischen-gefangenen/. Organized by the Palestinian Community in Koblenz. Bonn, Germany – 2 pm to 4 pm, Friedensplatz, Bonn: Info Stand on BDS and Palestinian prisoners’ hunger strike. for more information: https://www.facebook.com/groups/bds.bonn/permalink/1906146039597085/ Organized by BDS-Gruppe Bonn. Milan, Italy – 4 pm, Piazza Cordusio, Milan: solidarity with Palestinian Prisoners on Hunger Strike. Organized by the Palestinian Association in Italy. Melbourne, Australia – 3 pm to 5:30 pm, Trades Hall, 54 Victoria Street, Melbourne: Palestinian Prisoners’ Day Event. for more information: https://www.facebook.com/events/1279677832086814/ Organized by Fateh Movement Melbourne. Athens, Greece – 10:30 am, Gather on Patission and Chalkokondili, march to Syntagma Square and then to Israeli Embassy, Athens: Support Palestinian Political Prisoners. More information: http://laiki-enotita.gr/?p=8410 Organized by Popular Unity. Liege, Belgium – 12 pm, Place Saint-Paul, Liege: Solidarity with Palestinian Prisoners on Hunger Strike. For more information: https://www.facebook.com/events/1298181800259724/ Organized by Association Belgo-Palestinienne-Liege. Copenhagen, Denmark – 12 pm to 5 pm, Faelledparken, Copenhagen: Tent for Palestinian Prisoners at May Day, with the participation of artist Salim Assi. Organized by the Palestinian National Alliance in Denmark. Arras, France – 10 am to 6 pm, Stand of AFPS Nord-Pas de Calais, Place des Héros, near the belfry, Arras: Book Fair for May Day. Organized by AFPS Nord-Pas de Calais. Saint-Etienne, France – 3 pm to 5 pm, City Center, Saint-Etienne: May Day gathering – support Palestinian prisoners. 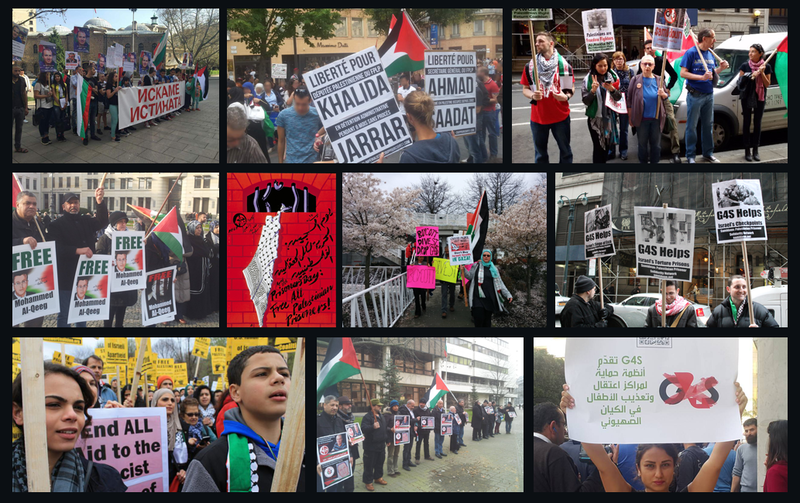 Cologne, Germany – 12 pm, Hans-Buckler-Platz, Cologne: Information on solidarity with Palestinian prisoners at the May Day demonstration. Organized by the Palestinian community of Cologne. Dublin, Ireland – 6 pm, O’Connell Bridge, Dublin: Palestinian Hunger Strike Solidarity/1981 Black Flag Vigil. For more information: https://www.facebook.com/events/659119907622292/ Organized by eirigi. Edinburgh, UK – 5:30 pm to 7:30 pm, outside St Johns, West End, Princes Street, Edinburgh: solidarity with Palestinian Political Prisoners. For more information: https://www.facebook.com/events/1855017678069771/ Organized by SPSC Edinburgh. Fort Lauderdale, FL, USA – 7 pm to 9 pm, US Federal Courthouse, 299 E. Broward Blvd, Fort Lauderdale: Rally in Solidarity with Palestinian Hunger Strike. For more information: https://www.facebook.com/events/579931158844268/ Organized by Al-Awda South Florida. Stuttgart, Germany – 4 pm to 6 pm, Konigstrasse Ecke Marstallstrasse, Stuttgart: Solidarity with Palestinian Prisoners on Hunger Strike. Berlin, Germany – 10 am to 6 pm, Alexanderplatz, Berlin: Hunger strike action in solidarity with Palestinian prisoners. Organized by the Palestinian National Action Committee in Berlin. Brussels, Belgium – 4 pm, Place de la Monnaie/Muntplein, Brussels: Protest in solidarity with Palestinian prisoners on hunger strike. Organized by a group of Belgian associations. Cologne, Germany – 3 pm, Domplatte, Cologne: Solidarity with Palestinian prisoners on hunger strike. Organized by the Palestinian community of Cologne. New York City, US – 5:30 pm, Best Buy Union Square, 52 E. 14th St, NYC: Protest to free Palestinian prisoners and boycott HP. For more information: https://www.facebook.com/events/191869654662310/ Organized by Samidoun Palestinian Prisoner Solidarity Network. Vienna, Austria – 6:30 pm to 9:30 pm, OKAZ – Österreichisch Arabisches Kulturzentrum, Gusshausstraße 14/3, 1040 Vienna: Commemoration of the 40th day of the assassination of Basil al-Araj. For more information: https://www.facebook.com/events/187418165107576/ Organized by the Friends of Basil al-Araj, with OKAZ, Handala Palestinian Cultural Forum, Palestine Arab Club. Manchester, UK – 12 pm to 3 pm, Picadilly Gardens, Manchester: BDS protest: Manchester Day of Action for Palestinian Prisoners. For more information: https://www.facebook.com/events/424909251209003/ Organized by the Manchester Boycott Israel Group. Berlin, Germany – 3 pm, Rathaus Neukölln, Karl-Marx-Strasse 83, Berlin. Protest for Palestinian Political Prisoners, on the 40th day of the assassination of Basil al-Araj. For more information: http://palaestina-solidaritaet.de/2017/03/30/berlin-sa-15-04-2017-kundgebung-zu-politischen-gefangenen/ https://www.facebook.com/events/1854956604763820/ Organized by the Democratic Palestine Committees – Berlin. London, UK – 3 pm to 5pm, Under Hungerford / Golden Jubilee Bridges on the Southbank, London: Palestinian Prisoners Day London. For more information: https://www.facebook.com/events/1986958591533520/ Organized by Inminds. Wicklow, Ireland – 2 pm, Bray co. Wicklow: Palestine prisoner Solidarity bloc at 1916 March and Commemoration. More details to come. Organized by Irish socialist republicans. Glasgow, Scotland – Outside Barclays Bank, Glasgow: Day of Solidarity with Palestinian Prisoners. Organized by Glasgow Fight Racism Fight Imperialism. Paris, France – 2 pm to 5 pm, Place de la Republique, Paris: Journée Internationale Des Prisonniers Politique Palestiniens. For more information: https://www.facebook.com/events/724460024403259/ Organized by Palestine House. Malmo, Sweden – 3 pm to 4:30 pm, Möllevångstorget, 214 24 Malmö: Protest PA Security Coordination with Israeli Occupation. For more information: https://www.facebook.com/events/775623225947822/ Part of the End Security Coordination series of actions for 17 April. Toulouse, France – 4 pm, Square du Général Charles de Gaulle, Toulouse: Rassemblement pour les Prisonniers Palestiniens! For more information: https://www.facebook.com/events/601896656681838/ Organized by Coup Pour Coup 31. Nanterre, France – 8:30 pm to 11 pm, Cinéma Les Lumières, 49 rue Maurice Thorez, 92000 Nanterre: Projection du film “3000 nuits”. For more information: https://www.facebook.com/events/1385657454828299/ Organized by AFPS Nanterre. Madrid, Spain – 7 pm, Salon de Plenos, Junta Municipal Retiro, Metro Pacifico, Madrid: Día Internacional de las presas y presos palestinos. Organized by Sodepaz, Women’s Boat to Gaza, Unadikum, Paz con Dignidad an others. London, UK – 1 pm, 52 Galena St, London: Protest PA Security Coordination w/ Israeli Occupation. For more information: https://www.facebook.com/events/283079908796371/ Part of the End Security Coordination series of actions for 17 April. Berlin, Germany – 3 pm to 5 pm, Hermannplatz, Berlin: Protest PA Security Coordination w/ Israeli Occupation. For more information: https://www.facebook.com/events/810752369078977/ Part of the End Security Coordination series of actions for 17 April. Stockholm, Sweden – 4 pm to 6 pm, Rådmansgatan 48, SE-113 57 Stockholm: Protest PA Security Coordination w/ Israeli Occupation. For more information: https://www.facebook.com/events/752153938293311/ Part of the End Security Coordination series of actions for 17 April. Amman, Jordan – 6 pm to 8 pm, Riyad al-Mufleh 27, Amman, Jordan: Protest PA Security Coordination w/ Israeli Occupation. For more information: https://www.facebook.com/events/1885979978336285/ Part of the End Security Coordination series of actions for 17 April. New York City, US – 5 pm to 7 pm, 115 E 65th St, New York: Protest PA Security Coordination with Israeli Occupation. For more information: https://www.facebook.com/events/1857531881194874/ Part of the End Security Coordination series of actions for 17 April. Washington, DC, US – 4:30 pm to 6 pm, 1732 Wisconsin Ave NW, Washington, DC: Protest PA Security Coordination with Israeli Occupation. For more information: https://www.facebook.com/events/246258285781904/ Part of the End Security Coordination series of actions for 17 April. Boston, MA, US – 4 pm, Park Street MBTA Station, Boston: Protest PA Security Coordination with Israeli Occupation. For more information: https://www.facebook.com/events/458303734505885/ Part of the End Security Coordination series of actions for 17 April. Los Angeles, CA, US – 3 pm to 5:30 pm, 11766 Wilshire Blvd #1600, Los Angeles: Protest PA Security Coordination with Israeli Occupation. For more information: https://www.facebook.com/events/273747333066325/ Part of the End Security Coordination series of actions for 17 April. San Diego, CA, US – 7 pm to 9 pm, UCSD Raza Resource Center, 9500 Gilman Drive, La Jolla: Discussion on Prisoners Day and Security Coordination. For more information: https://www.facebook.com/events/668576439996111/ Part of the End Security Coordination series of actions for 17 April. Nanterre, France – All day, Université Paris Nanterre: Journée de solidarité étudiante pour la Palestine, student letter-writing for Palestinian prisoners. For more information: https://www.facebook.com/events/1867322946874659/ Organized by the Étudiant.e.s Communistes Nanterre. Leuven, Belgium – 8 pm to 10:30 pm, Van Den Heuvelinstituut 29.2, Dekenstraat 2, Leuven: Israel tortures, KULeuven ignores. For more information: https://www.facebook.com/events/301448586940488/ Organized by the Stop Law Train Coalition. Brussels, Belgium – 2 pm to 4 pm, Rond-point Schuman, Brussels. Demonstration in solidarity with Palestinian political prisoners. For more information: https://www.facebook.com/events/1367332569989947/, organized by the Palestinian Community of Belgium and Luxembourg. New York City, US – 5:30 pm, Best Buy Union Square, 52 E. 14th St, NYC: Protest to free Palestinian prisoners and boycott HP. For more information: https://www.facebook.com/events/707830809407918/ Organized by Samidoun Palestinian Prisoner Solidarity Network. Athens, Greece – 6 pm, Syntagma Square: Protest to Support Palestinian Prisoners on Hunger Strike. Waterford, Ireland – 2 pm to 3 pm, John Roberts Square, Waterford: Palestinian Political Prisoner Solidarity Protest. For more information: https://www.facebook.com/events/149770245547978/ Organized by Anti Internment Munster. Toronto, Canada – 1:30 pm to 3:30 pm, OISE, Room 4-414, 252 Bloor St. W., Toronto: Criminalizing Resistance – Joint Struggles of Land Defenders, Human Rights Activists, and all who Struggle for Liberation. For more information: https://www.facebook.com/events/178140356027878/. Organized by Actions4Palestine. Brighton, UK – 1 pm to 3 pm, The Clocktower, Brighton: Solidarity with Palestinian Prisoners on Hunger Strike. Berlin, Germany – 4 pm, Potsdamer Platz, Berlin: Rally in Solidarity with Palestinian Prisoners on Hunger Strike. For more information: http://palaestina-solidaritaet.de/2017/04/19/berlin-22-04-2017-protestkundgebung-fuer-die-palaestinenischen-gefangenen/ Organized by the Palestinian National Action Commission in Berlin. Stuttgart, Germany – 4 pm, Stuttgart Königstrasse Ecke Marstallstraße. Am Brunnen, Stuttgart: Vigil to support the Palestinian Prisoners. Organized by Women for Palestine of Stuttgart. Uppsala, Sweden – Central Square, Uppsala: Solidarity with Palestinian Prisoners on Hunger Strike. Organized by the Association of Palestinian Refugees. Athens, Greece – 7 pm, Athens University of Economics and Business: Evening of Solidarity with the Struggle of Palestinian Prisoners. For more information: https://www.facebook.com/events/205442036623165/ Organized by Samidoun Palestinian Prisoner Solidarity Network. Johannesburg, South Africa – 12 pm, Women’s Jail, Constitution Hill, 11 Kotze St, Johannesburg: Press Conference – Free Palestinian Political Prisoners (South African Campaign). For more information: http://nc4psouthafrica.com/press-conference-announcement-of-actions-in-solidarity-with-hunger-strike-launched-by-palestinian-political-prisoners/ Organized by the National Coalition for Palestine, BDS South Africa and more. Detroit, MI, US – 1 pm (rally at 1:00 PM, hearing starts at 2:30 PM), U.S. District Court, 231 W. Lafayette Blvd., downtown Detroit, Michigan: All Out to Support Rasmea Odeh. For more information: http://justice4rasmea.org/news/2017/04/06/all-out-to-detroit-for-plea-hearing/ Organized by the Rasmea Defense Committee. County Armagh, Ireland – 7:30 pm, Garvaghy Road, Portadown: Vigil in Solidarity with the Palestinian Hunger Strikers. Organized by the Ireland Palestine Solidarity Campaign. Siena, Italy – 4 pm to 7 pm, Piazza Antonio Gramsci, Siena: Siena for Gaza with the Palestinian prisoners. For more information: https://www.facebook.com/events/150968285436406/ Organized by L’Altra Europa and Si Toscana a Sinistra.